Jeep took its sweet time with the replacement for its aging Compass, along with its slightly higher-riding Patriot twin, but the wait may have been worth it. The 2017 Jeep Compass takes many styling cues from the ruggedly handsome Grand Cherokee, and is arguably the best-looking of Jeep’s three compact crossovers. The Compass received a face-lift for the 2011 model year, which marked Jeep’s first attempt at making a baby Grand Cherokee. The rectangular headlights and seven-slat grille carry over, but are stretched and made narrower to better fill out the wider front end. Trailhawk models look more menacing with blacked out grille slats and black accents on the hood. When viewed from the side, it becomes even clearer that the Compass is an all-new vehicle. The front end comes to more of a point on the new model, and the beltline kinks upward at the rear quarter window. The indented character line that ran across the bottom of the doors is gone, and the fenders now feature plastic cladding. Just like the front, the rear end brings to mind the Grand Cherokee. Horizontally oriented taillights replace the previous model’s vertical lamps, and overall the rear is less angular and blocky. The old model may have the edge when it comes to rear visibility, as the 2017 Compass’ rear window is narrower thanks to the higher beltline. Inside, there’s really no comparison. The outgoing vehicle’s interior looks like it’s nearly 10 years old because it is. Meanwhile, the 2017 Compass’ cabin looks modern and stylish, again drawing heavily from the Grand Cherokee’s design. The central touchscreen ranges in size from 7.0 to 8.4 inches, and runs FCA’s latest Uconnect infotainment system. 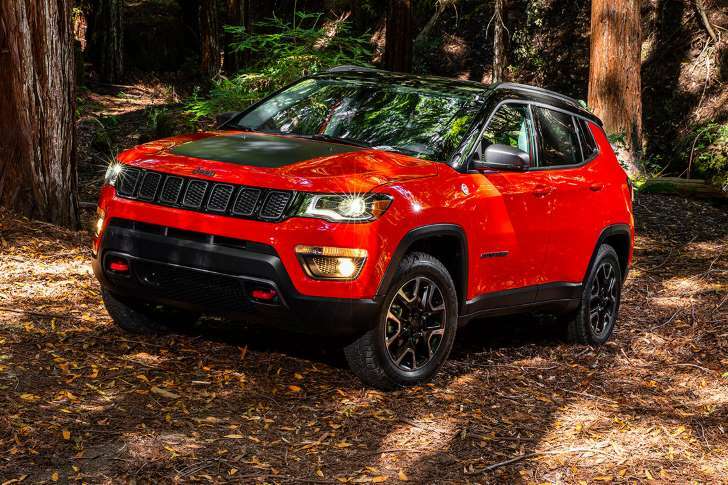 What do you think of the 2017 Jeep Compass? Is it a design home run or does Jeep need to move away from the Grand Cherokee’s styling? Tell us in the comments below. Last week, we asked you about the redesigned 2017 Mazda CX-5, and your comments were overwhelmingly positive.